There’s no doubt this sensor-festooned machine is the testbed for the next-generation KTM 1090 Adventure. In fact, under that work-in-progress fairing, the bike’s mechanical bits appear to be much the same as those of the existing model. While there have been suggestions of a capacity hike to 1150cc and a corresponding power increase, the fact that this test bike uses the stock 1090 exhaust system indicates it’s still using an unchanged, 1050cc engine as used on the current version. Similarly, the frame and suspension appear to be unaltered, and even the tail bodywork hasn’t changed. The front bodywork, however, is completely new. But rather than the nose, with its Cyberman-style eyes and ‘mouth’, the big news is the lower fairing. The bellypan section is surprisingly bulky, suggesting it might hide a new, low-mounted fuel tank. It’s an arrangement that KTM is already set to introduce on the new 790 Adventure in 2019, and one that offers two notable benefits over a conventional tank position. First, it allows the weight of the fuel to be held low down, making the bike feel lighter and less likely to topple. Secondly, it means the area where the tank would normally be can be made smaller, allowing for a lower seat and making the bike slimmer between your knees. As a bonus, shifting the fuel can also open up more space for the airbox, particularly on a V-twin like the 1090 Adventure, where both the fuel tank and airbox are competing for space in the same area. The test equipment fitted to the bike appears to be focusing on its aerodynamics. The rider’s jacket is covered in small streamers intended to give a glimpse of airflow, and the huge tower attached to the bike’s tail is likely to include sensors for air speed, temperature and pressure. Similar kit appears on Formula One cars during winter testing, and in this instance it’s likely KTM is testing a variety of windscreen shapes and sizes. 2020 models rather than the 2019 machines. As well as the possible repositioned fuel tank, the next-generation bodywork appears to incorporate a notable opening in its nose. There’s a single daytime running light mounted in this space, with two circles higher up that could become main-beam headlights on the finished bike. The opening itself probably isn’t an air intake, though. 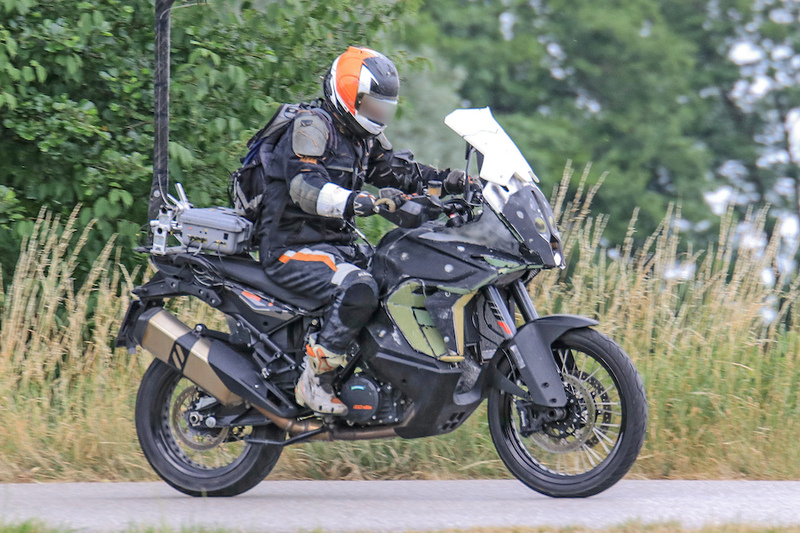 Instead, it could be the position for KTM’s upcoming forward-facing radar sensor, which will give the bike an adaptive cruise control system that automatically keeps a safe distance from vehicles ahead.